As of September 2011, an estimated 100000 students from over 45 countries had already joined what is being described as “the world’s largest chemistry experiment.” This global experiment, “Water: A Chemical Solution,” explores the chemistry of water and the role of water in society and the environment. The Global Experiment, a joint effort of IUPAC and UNESCO, is a cornerstone activity of the International Year of Chemistry. “The shared quantity of data that we will be able to produce will be of great interest and value. Scientists are always after standards that we can measure against. No one has done anything like this before with the world’s pH,” said Declan Fleming, an RSC School Teacher Fellow, on the BBC’s radio show Science in Action. 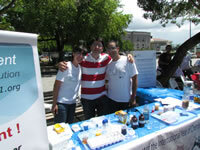 Javier Garcia-Martinez (center) poses with chemistry graduate students demonstrating the Global Water Experiment at the Festival de Quimica in Old San Juan on Sunday, 31 July. Garcia chairs the IUPAC task group that developed the experiment. One of the main objectives of the Global Experiment is to allow educators and students from all around the world to interact using social media and share experiences, news, and pictures. The most popular social tools like Twitter and Facebook are fully integrated in the website as are several You Tube videos about the experiment. After more than a year of dedicated planning and implementation, the project launched successfully at the UN World Water Day, 20–22 March in Cape Town, South Africa. Hundreds of 15–18–year-old students from Cape Town townships carried out experiments to test water quality, measure salinity and acidity, and learn how water is filtered and distilled. During the “Big Splash,” which coincided with the South African National Water Week, students were exposed to different activities that emphasized the importance of water in their city. Great efforts have been made to make the Global Experiment a truly global activity. The website is available in five languages: English, French, Spanish Chinese, and Russian. From the very beginning it was clear that if the Global Experiment was to be truly global it needed to be made available to every school, even to those without the most basic materials. In order to encourage the participation of low-income communities, 150 schoolpacks containing 10 Global Water Kits and a School Resource Kit have been sent to over 30 countries for free. The kits can be purchased from the Radmaste Centre at the University of Witwatersrand in South Africa <www.radmaste.org.za>. This could be the first- and largest-ever crowdsourcing chemistry experiment, but for sure it is already a great educational activity that aims to educate and engage young people on the key role of science in the future of this planet.